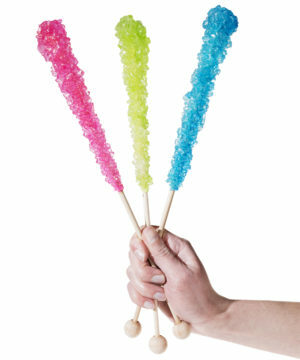 Giant Rock Candy Sticks: A jumbo version of the classic sugary treat. Nostalgia just got even sweeter. Giant Rock Candy Sticks are supersized versions of your favorite old-fashioned candy with an even bigger taste than you remember. Each wooden stick is loaded with over half a foot of sugar crystals in one of three different flavors. Lick your way through the fruity hard candy or just take a big ol’ bite. The eye-catching colored candy is as tasty as it is fun, so you’ll be thankful you have plenty of it. Note: Flavors are chosen randomly because we receive them as a random assortment from the manufacturer. You’ll receive one supersized stick (randomly chosen) per order. The good ol’ days become the big ol’ days as you enjoy a flavored Giant Rock Candy Stick. These sticks of hard candy are much larger than the general store variety but feature the same sugary sweetness and charming simplicity. Whether you want to patiently lick them down or chomp off a big bite, you’ll have over six inches of candy crystals to enjoy (which is more than you can shake a sugar stick at). Over 6 inches of rock candy! 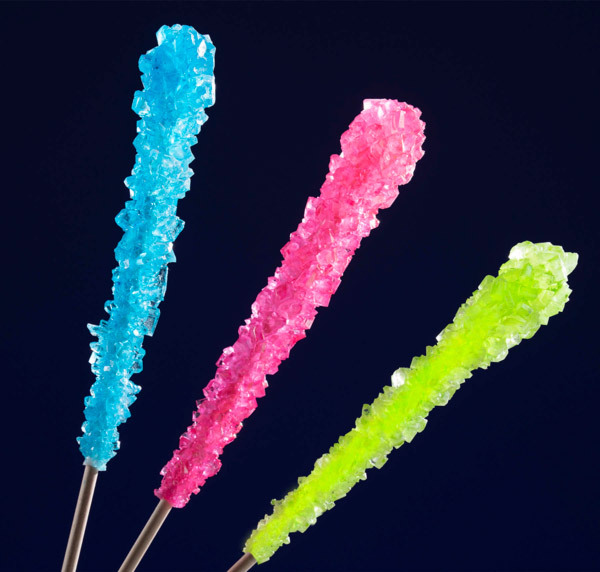 Traditional rock candy is made of small, plain sugar crystals that formed on a string or stick. Giant Rock Candy not only jumbo-fies that process but also adds delicious fruit flavoring! Munch on blue raspberry, watermelon, or cherry rock candy that has a fun color to match its fruity taste. Three flavors: blue raspberry, watermelon, and cherry. Question: What flavor will I get? Answer: Due to the way we receive this product, we can not take flavor requests. 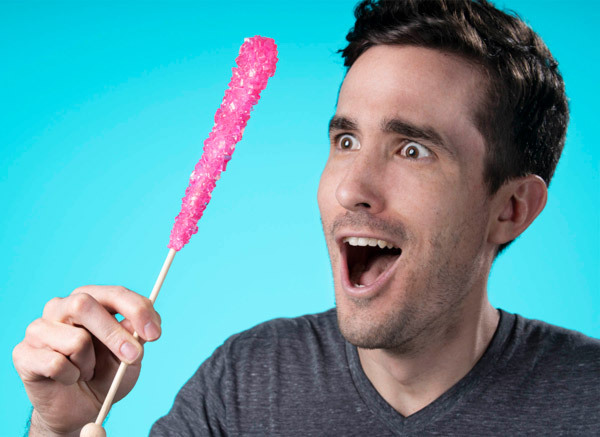 You will receive one Giant Rock Candy Stick per order with the flavor chosen at random. After sampling (and resampling) the flavors, we can confirm that they’re all delicious. Question: Aren’t these easy to make? 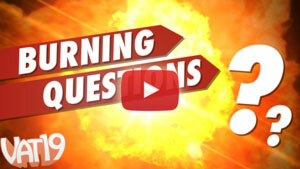 Answer: Although time-consuming, basic rock candy is not hard to make. But making sticks this big and with tasty fruit flavors is much more work than we’re willing to do.